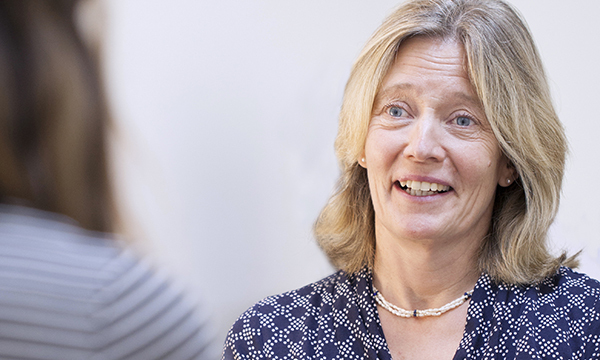 As head of pastoral care and psychological support at one of the UK’s leading cancer hospitals, Sara Lister has a lot of responsibilities. She manages the department that provides spiritual and psychological support to patients, families and staff at London’s Royal Marsden NHS Foundation Trust. She also co-edits the respected Royal Marsden Manual of Clinical Nursing Procedures, and teaches nursing students. Her remit is broad, including the hospital’s chaplaincy service, liaison psychiatry, staff counselling and the patient advice and liaison service. Ms Lister is unusual in her profession – a nurse who is also a trained counsellor. She brings both these skillsets to her roles as manager of a substantial department and as a counsellor for patients who are finding it difficult to cope emotionally with their diagnosis or treatment. ‘It is a real privilege to be able to come from a physical nurse training background and be able to give patients an hour of my time, developing a relationship and looking at the whole person. She is well aware of the psychological effect that cancer has on people, and one of her primary responsibilities is leading the trust’s psychological support for adult patients. This involves managing a multidisciplinary team comprising nurse counsellors, psychologists, a family therapist and an art therapist. People have different responses to cancer and treatment, she says, and counselling is tailored to each person’s needs. This usually involves up to six sessions using an integrative approach combining different techniques, such as person-centred counselling or cognitive behavioural therapy. Some want to explore existential issues, she says. ‘They are trying to make sense of what life is about – that’s something that’s important to them. I provide a safe place for them to discuss things that they may not want to discuss with family and friends. Successful cancer treatment can also make people want to shake up their lives, she says – change their job, for example, or even leave a marriage. Others whose cancer or treatment has left a lasting physical impact might have to consider alternative employment because they are no longer able to do the job they had previously. Although the hospital does not offer stand-alone support to patients’ relatives, families can be seen with the patient. The team members also support each other, and other staff at the hospital, and the counsellors receive independent supervision to help them cope with a workload that can be emotionally gruelling. The team can draw on the help of leaders from different faiths when requested, and also has links with humanists. If the level of distress is so great that a patient is talking about harming themselves or wanting to end their life, they should receive a mental health assessment. This can be via their GP or, if they are a hospital inpatient, through the psychiatric liaison service. If neither of these are available and the risk is considered high, the patient should be referred to an emergency department with a mental health service. Such situations should always be taken seriously, as cancer patients are at increased risk of taking their own lives. It can be difficult for nurses in general to support patients with the ‘big’ spiritual issues, she concedes, so working with the chaplaincy is a valuable experience for nursing staff as well as patients and families. Ms Lister believes that nurse counsellors have a big contribution to make in looking after patients’ emotional and spiritual needs. ‘It’s a significant role,’ she says, adding that there is currently a vacancy on her team for a nurse with formal counselling qualifications. For Royal Marsden team member Beverley Henderson, working as an intensive care nurse inspired her to train as a counsellor. ‘My work in the intensive care unit was one-to-one and involved a lot of support for relatives – I found it very satisfying,’ Ms Henderson says. Although her background was not in cancer nursing, she recognised that the Royal Marsden nurse counsellor post was perfect for her interests and skills. Ms Henderson offers counselling by telephone, which is particularly appreciated by patients who live some distance away from the hospital – as a tertiary unit, it covers a large geographical area. It is also helpful for people who find travelling difficult as a result of their cancer or treatment. ‘People are triaged and asked if they want face-to-face or telephone counselling, so in a way it is self-selecting,’ Ms Henderson says. ‘I always start by talking to people about how important it is to feel connected, but in my experience, some people find it easier to say things on the telephone than when they are sitting looking at someone. She offers six sessions, although some people need fewer and others more, she says. The patient profile tends to be similar to those who have face-to-face counselling; that is, people at the point of diagnosis, having a change in treatment, at the end of treatment, or those dealing with bad news. ‘People who are particularly unwell or near end stage often appreciate not having to make the trip to the hospital,’ Ms Henderson adds. She is acutely aware that the job of counselling people to help them through tough times can have an impact on the counsellor too. ‘I have reduced my hours because it was beginning to affect me,’ she says. ‘I have supervision and I know my triggers – I’m pretty careful with self-care. This aspect of her work has had an impact on her own attitude, she admits. ‘I live a very full life; I seize the moment,’ she says. She believes that nurse counsellors make a valuable contribution to the care and support of patients and would like to see the role adopted more widely.